A 30-story condominium in North Miami Beach, Florida, suffered slow drain and clog issues in laundry rooms on each floor, and owners needed a solution – quickly. 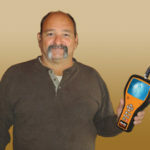 So, they called Gregg D’Attile, owner of Art Plumbing AC & Electric in nearby Coral Springs. With the convenience of building owners and occupants at stake, D’Attile knew that his company had to do the job quickly. That’s when they arrived with their model JM-1450™ electric water jet from General Pipe Cleaners. Part of General’s popular Jet-Set® line of water jets, the JM-1450 uses high-pressure water to clear conduits clogged with grease, sand, sludge and ice. 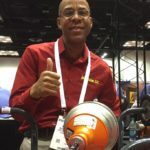 Perfect for smaller, indoor jobs with 1-1/2″ to 4 ” lines, the compact, portable and environmentally friendly machine generates 1500 psi at 1.7 gallons per minute, yet only pulls 13 amps. JM-1450 portability proved helpful, too. D’Attile notes that larger, heavier jetters would prove troublesome to transport up a 30-story building and difficult to maneuver in tight work areas. Not so with General’s machine. Overall, the JM-1450’s height is just 29″. 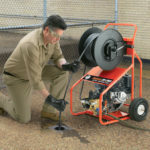 Remove the easily detachable, 150-foot capacity hose reel with brake and the height drops to just 14″. The JM-1450 also sports a heavy-duty frame with two 8″ semi-pneumatic tires. It also features a slide-out handle to facilitate transporting. The JM-1450’s design and performance gave D’Attile the reliability, portability and power to handle the whole job with minimal disruption to building occupants. Starting from the top story, the drain cleaning professionals rapidly and methodically moved through each of the building’s laundry rooms. The tedious task took less than three days. And the skill and professionalism of Art Plumbing AC & Electric’s crew earned D’Attile a yearly preventive maintenance contract from condominium owners.